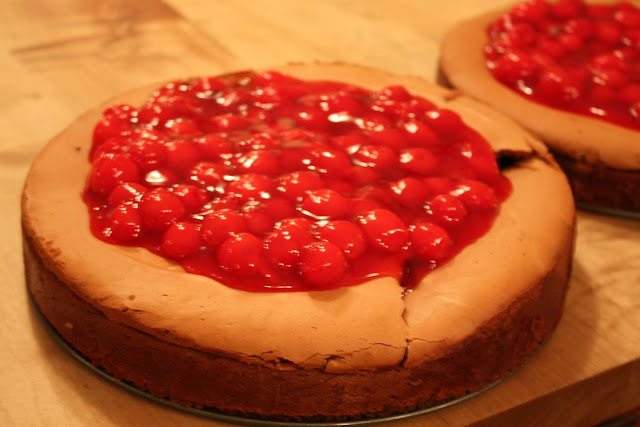 Anyway,.... here, as promised (I'm learning not to promise things here on my blog~ life tends to get in the way....) is our family's favorite Black Forest Cheesecake! *Disclaimer: this recipe is neither healthy nor low-fat, but it can be made gluten-free and it is yummy...... super-yummy! First, you will need to crush the chocolate cookies. 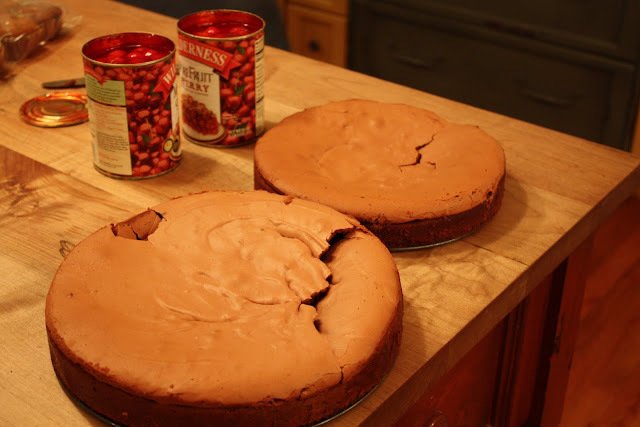 We use chocolate graham crackers from Wal Mart ~ not gluten free for one cheesecake and then use gluten free cookies for the GF cheesecake or sometimes I simply make the GF cheesecake without a crust. Trust me, it's still good! 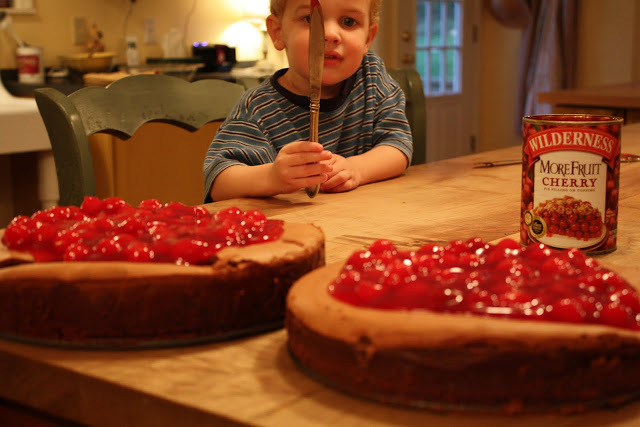 This recipe makes 1 cheesecake. We almost always double it. ok, we always double it! And please don't ask how long the leftovers last here~ I'm sworn to secrecy. 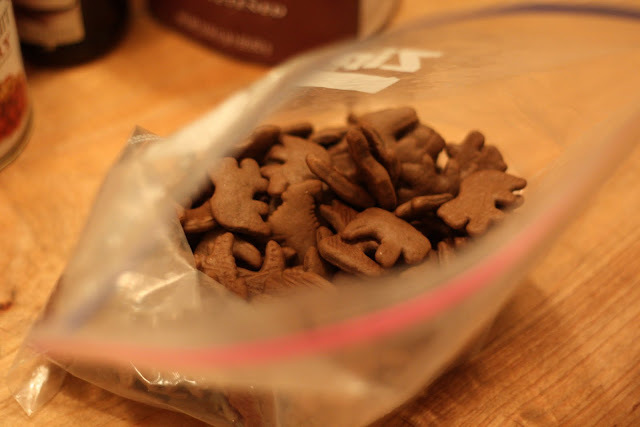 Here are the cookies in a gallon ziploc bag, ready for the teenaged boy crushing crew. 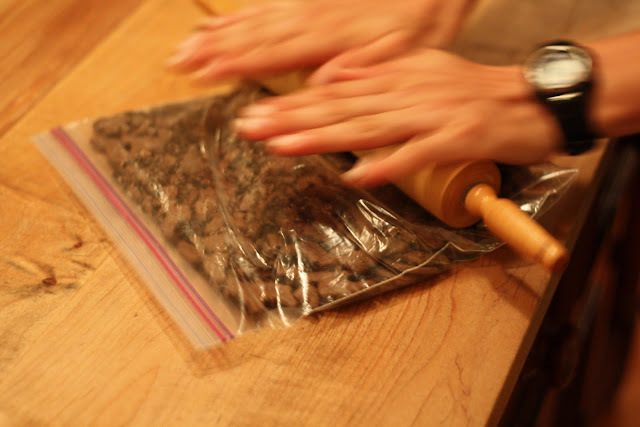 And here is my personal 14-year-old-chocolate-cookie-crusher in action! Don't you wish you had one of those? 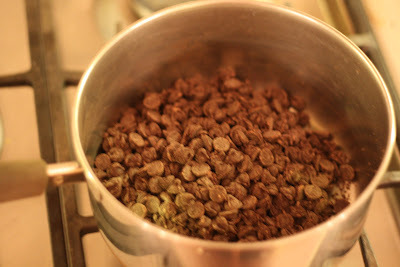 While the crusher is busy crushing, I begin melting the chocolate chips, stirring constantly over low heat. Once they are melted, I just turn the burner off (I use gas) and let them sit for a minute while I blend the other ingredients in my Bosch mixer. 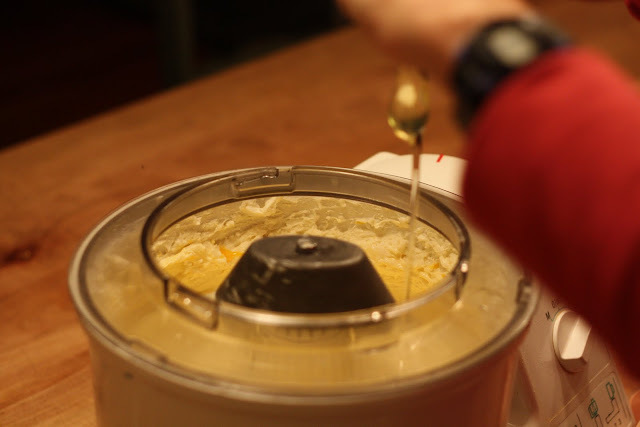 Beat the cream cheese and sugar at high speed in the mixer, then gradually add the eggs, one at a time. 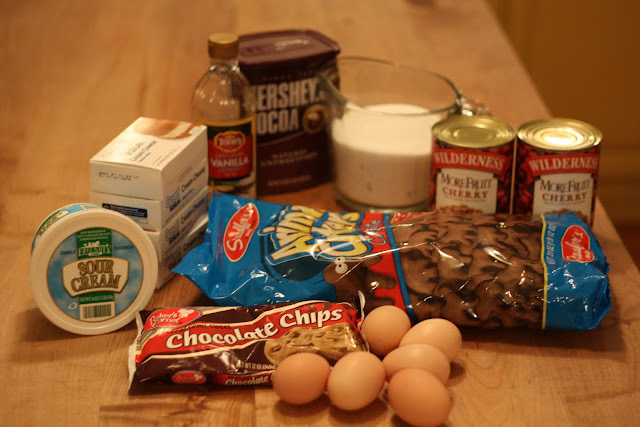 Once those are incorporated, you can add the melted chocolate chips, vanilla, cocoa and sour cream. 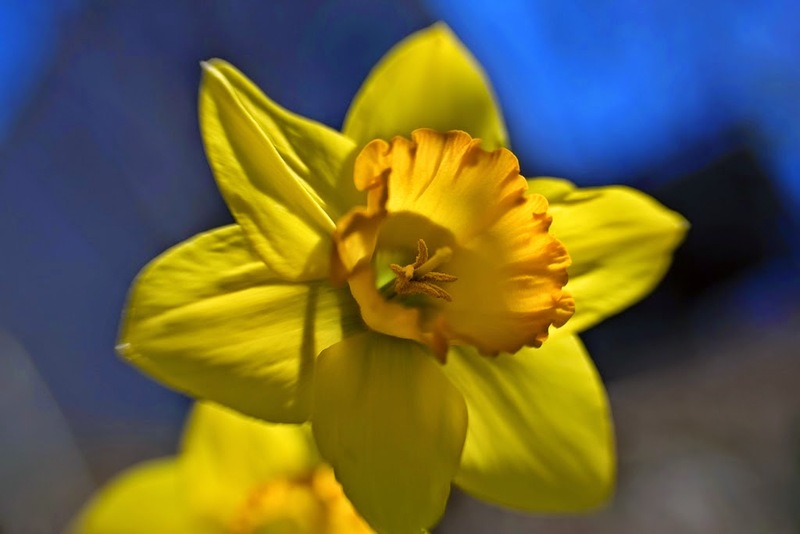 Once you have all the ingredients blended together, you simply pour this mixture into your springform pans. Be sure to put your crushed cookies in the pan first, then pour the cheesecake mixture on top of that! Bake for 1 1/2 hour at 300 degrees F. After removing from oven, allow to cool for 20ish minutes, then run a knife around the edges of the pan to release the cheesecake. Refrigerate for at least 8 hours. (I like to refrigerate the cherry pie filling as well). Ignore the mushed cake... that would be my fault! Oops. Trust me, it was still consumed in record time! Here's Tim, ready to dig in! Sounds great! We have birthday season coming up in our family, too. We will have to put this in the choices of cakes. I think I will pick it! This looks delicious! I will have to try it sometime -- except I don't have a springform pan. I am jealous of you for having an Aldi's to shop at! We moved to an area with no Aldi's nearby and my grocery expenses sky-rocketed!! ouch! I sure miss being near one!